I’m always searching for an interesting meatless Monday idea and now that Spring is upon us I find myself craving lighter dishes in the evening. Quinoa seemed like the perfect light grain to stuff peppers with and I was trying to come up with something I could prep ahead of time that my husband could easily assemble for the boys if I was working late. I love roasting/grilling a big batch of vegetables and having them on hand to eat, I especially love it when I’ve made romesco or salsa verde to spoon on top. It’s such a satisfying meal or the perfect side to most dinners. 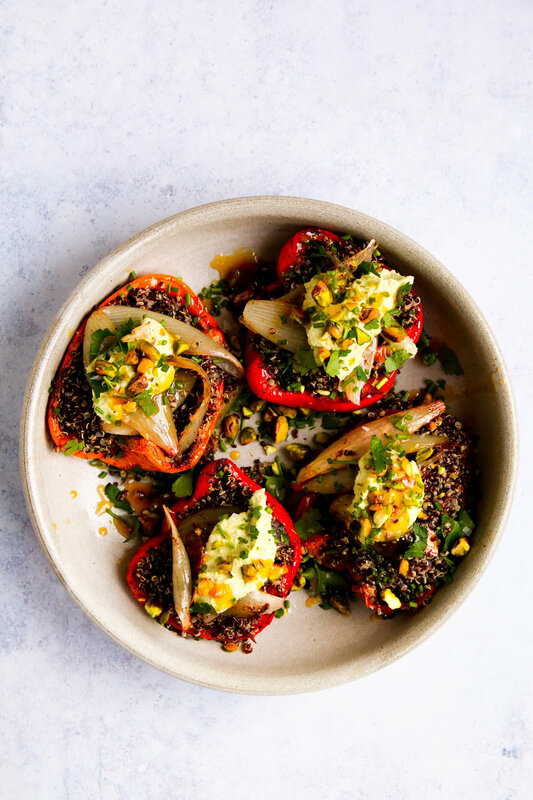 These roasted peppers are tossed with a little olive oil and some garam masala before being filled with quinoa and topped with a healthy drizzle of a tangy marmalade dressing. The crunchy topping of pistachios and spicy cashew cream tie in all the flavors. If you happen to have any extra cashew cream on hand it’s delicious slathered on crusty bread in the morning with avocado. A perfect addition to a meatless Monday. Preheat oven to 400°F or heat an outdoor grill on medium high. Brush the bell peppers, shallots and jalapeño with oil and place them on a baking pan in the oven for 15-20 minutes, until tender and blistered. If your grilling instead place vegetables directly on grill to char and soften about 10-15 minutes. Remove from oven or grill, place the peppers only in a sealed paper bag for 5 minutes, remove and gently peel off skin, keeping bell peppers intact to stuff. Slice jalapeño in half, remove seeds and roughly chopped, reserve for the cashew crema. Soak 1 cup cashews in water to cover for 2 hours. Drain cashews, then transfer them to a high powered blender, add 1/2 cup water, chopped jalapeño and 1/2 teaspoon salt. Blend until smooth, about 3 minutes. Place the peeled bell peppers, a tablespoon of olive oil and the garam masala into a large mixing bowl and toss gently to combine. For the dressing, combine the 1 tablespoon of chives, marmalade, vinegar and olive oil in a bowl and set aside. Season to taste with salt and pepper once mixed. 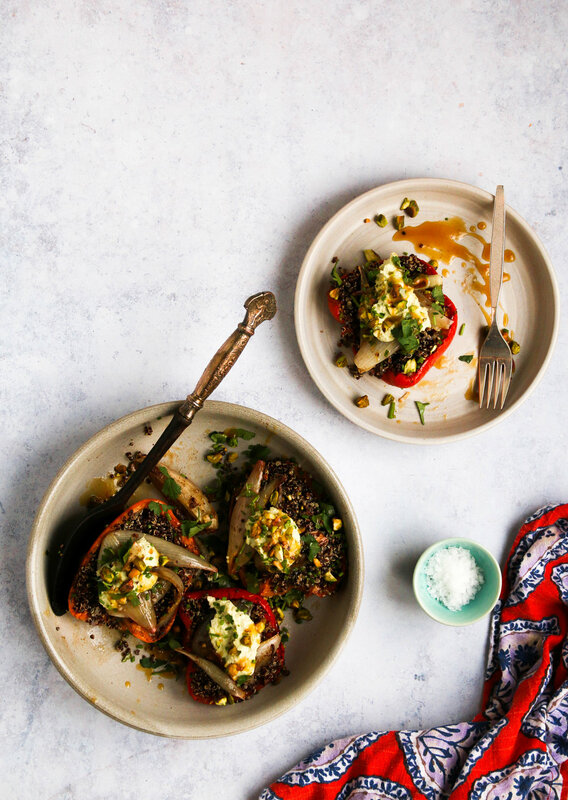 To serve, arrange the bell peppers halves on plates. Spoon some quinoa inside each pepper, I like to really stuff them full. Set the some of the roasted shallots on top and spoon some of the jalapeño crema over everything. Sprinkle with remaining herbs and pistachios. Drizzle the dressing over the top of each pepper and season to taste.